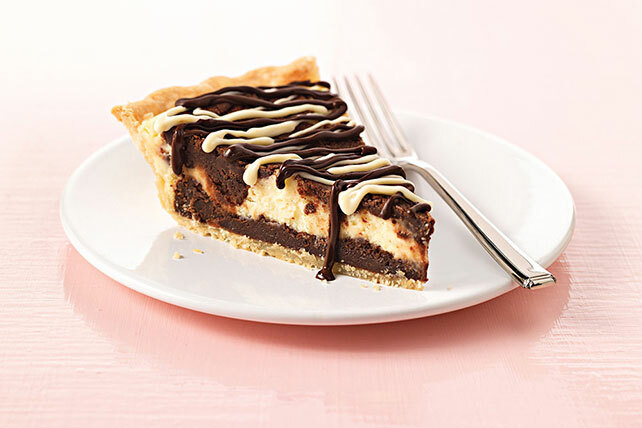 Enjoy layers of flaky pie shell, fudgy brownie batter & a ribbon of cheesecake in this Cream Cheese-Brownie Pie. Our Cream Cheese-Brownie Pie is luscious. Prepare crust in 9-inch pie plate as directed on package for one-crust filled pie. Beat cream cheese, 1/4 cup sugar and 1 egg in medium bowl until well blended. Microwave butter and 6 oz. semi-sweet chocolate in large microwaveable bowl on HIGH 2 min. or until butter is melted; stir until chocolate is completely melted and mixture is well blended. Add 2/3 cup sugar; mix well. Blend in vanilla and remaining eggs. Add flour; mix well. Spread half the brownie batter onto bottom of pie crust; top with cream cheese mixture. Cover with remaining brownie batter. Bake 45 min. or until toothpick inserted in center comes out with fudgy crumbs. (Do not overbake.) Cool completely. Melt remaining semi-sweet chocolate as directed on package; drizzle over pie along with the melted white chocolate. Spray 9-inch pie plate with cooking spray. Prepare filling as directed; pour into pie plate. Bake in 350°F oven 30 min. or until toothpick inserted in center comes out with fudgy crumbs. (Do not overbake.) Continue as directed. Make your next celebration extra special with this delicious pie.